Toronto captured its third consecutive Atlantic Division title this season, en route to setting franchise records for wins (56), home wins (32) and road wins (24). The team set records for consecutive wins (11), as well as consecutive wins at home (12).The city hosted its first All-Star game, and was represented by All-Stars Kyle Lowry and DeMar DeRozan. Lowry had his first career game-winner against the Cleveland Cavaliers. DeRozan recently passed Vince Carter for second on the franchise’s all-time scoring list. 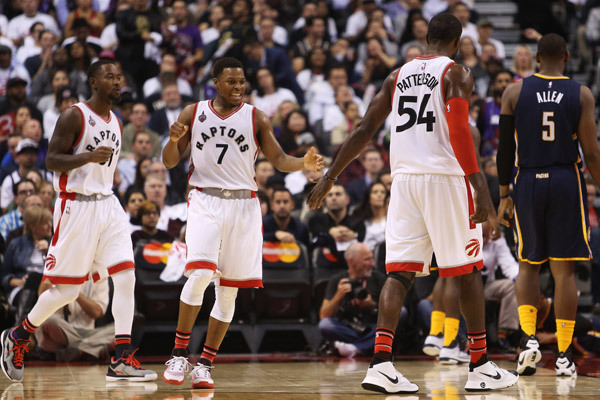 The Raptors will enter the postseason as a 2-seed, and the fourth best record in the league. It’s been a regular season for the record books, and the team hopes to continue to add to it in the playoffs. 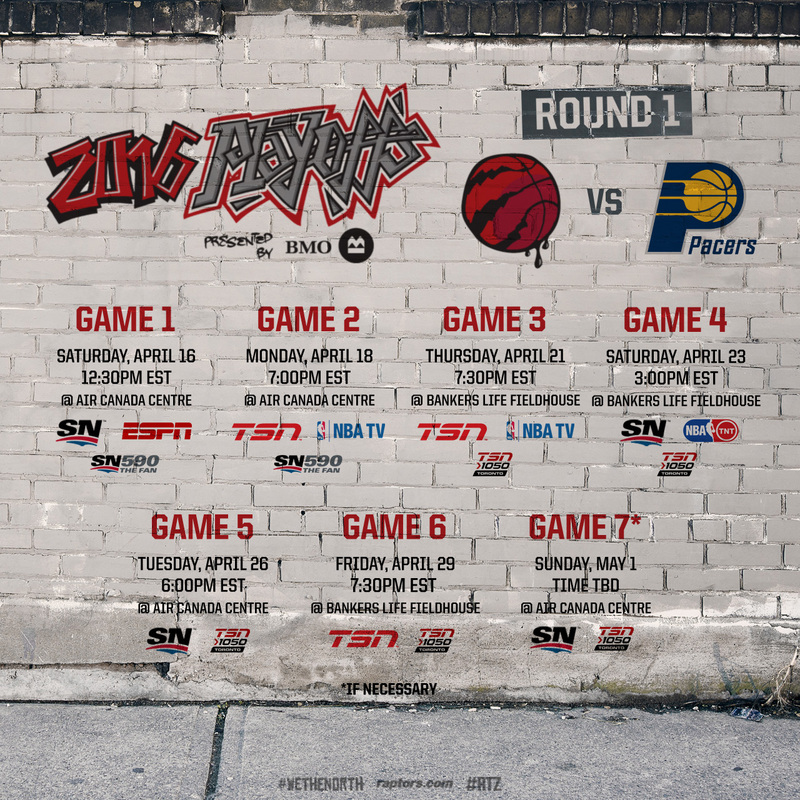 Toronto learned last year that the season series record often goes out the window when the postseason hits, but on the season, the Raptors are 3-1 against Indiana. The Raptors opened the season against the Pacers, with DeMarre Carroll drawing the defensive assignment of Paul George in his first game in a Raptors uniform. Their sole loss came in the second meeting between the two teams, where they built a 21-point lead in the first quarter, and then allowed a 39-4 Pacers run. The third meeting was a hard-fought Raptors victory in overtime where Bismack Biyombo grabbed 25 rebounds, setting a franchise-record. The final game in the series featured Toronto’s bench leading the way in a 13-point victory with Kyle Lowry, DeMar DeRozan and Luis Scola out for rest. While Toronto has been led by the All-Star play of Kyle Lowry and DeMar DeRozan all season, Paul George has been doing the same for Indiana. After missing 76 games in the 2014-2015 season because of an open fracture of the tibia and fibula bones in his lower leg, George returned to start in 81 games this season, averaging 23 points, seven rebounds, four assists and nearly two steals per game. The three-time All-Star is a lethal scorer and the Raptors will have their hands full trying to contain him. While Carroll looks forward to the challenge of stopping the opponents’ best scorer, DeMar DeRozan had one of his most memorable defensive sequences of the season against George down the stretch in Toronto’s overtime victory against the Pacers. DeRozan is averaging 23.5 points, 4.5 rebounds and 4.0 assists per game. Lowry is averaging 21.2 points, 4.7 rebounds, 6.4 assists and 2.0 steals. Expect the Raptors to give George different looks with different defenders. Expect the Pacers to try to make life difficult on DeRozan and Lowry — while also keeping them off the free throw line— and force other Raptors to step up. It isn’t common for the second seed in a conference to close the season starting a rookie, but Norman Powell isn’t your standard rookie. Powell, the 46th selection in last year’s draft, cracked the starting lineup after DeMarre Carroll had knee surgery and James Johnson was sidelined with plantar fasciitis. The UCLA alum has been a revelation for the Raptors. In 24 starts, Powell has a true shooting percentage of 59 percent, while making 43 percent of his 3-pointers. Myles Turner— Indiana’s 11th pick in the 2015 draft— is another rookie who has spent time in the starting lineup for a playoff team. Turner started 29 games for the Pacers, and averaged 10.4 points, 5.5 rebounds and 1.4 blocks in 22.8 minutes per game. Like Powell, Turner has played with confidence and poise in his first NBA season. It’ll be interesting to see if the two can stay cool under the bright lights of the postseason. 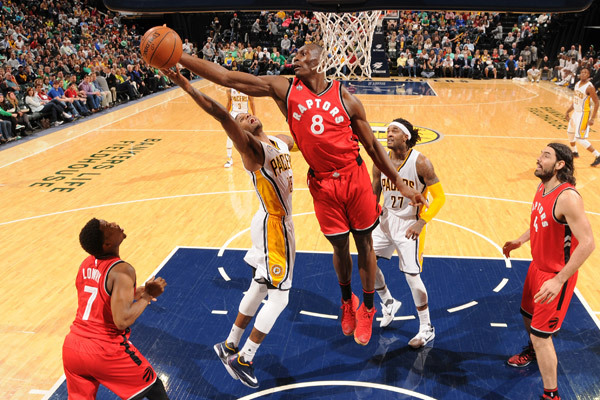 While Bismack Biyombo has been a fantastic addition for Toronto, Indiana’s Ian Mahinmi has also been solid. Biyombo has helped the Raptors improve their defence, while also sliding into the starting lineup when Jonas Valanciunas was out with a fractured hand. Mahinmi averaged nine points and seven rebounds as he made a case for appearing on most-improved ballots. Both will play an important role for their respective teams in the playoffs. It’ll be interesting to see how the battle beyond the arc shakes out in this series, as both teams averaged the same number of attempts (23) per game, with Toronto slightly ahead in makes (8.6 to 8.0). 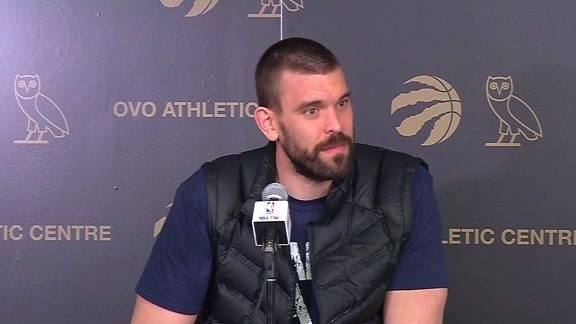 Kyle Lowry has always been a threat from three, DeMarre Carroll helps to space the floor, and Luis Scola has added the shot to his repertoire. Off the bench, Patrick Patterson and Terrence Ross have had success from deep, while Norman Powell has come on late. In Indiana, George Hill has had a solid season on both ends of the floor, making nearly 41 percent of his 3-pointers. C.J Miles is always a threat capable of drilling a handful of threes, while Paul George has seemingly endless range. The difference here is in defending the three: Indiana has seen some slippage in April, but on the season opponents are only making 33 percent of 3-pointers against the Pacers, while Toronto is allowing opponents to shoot 37 percent from downtown. As with the season series record, homecourt in the postseason is as big of an advantage as you make it. Still, with Toronto setting a franchise record with 32 victories at home, there isn’t anywhere they’d rather open the postseason. 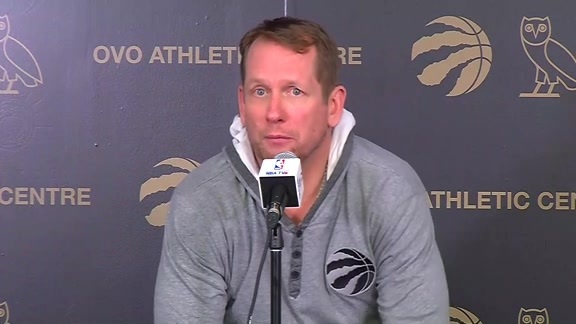 Raptors head coach Dwane Casey often says, “If you take care of home, home will take care of you” and this season his team has been better than ever before at doing that.